'The tracks of my tears' is one of those classic Motown tunes. Recorded by Smokey Robinson and the Miracles in 1965, it is actually listed on the Rock and Roll Hall of Fame's 500 songs that shaped Rock and Roll. But is it Rock and Roll? I'd like to consider it soul music. 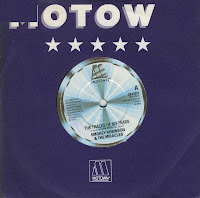 The single reached number 9 in the UK singles chart in 1969, whereas it only reached the Dutch Top 40 when it was re-released in 1987, although on that occasion it still only made number 37.